Join us at Linvilla Orchards on Saturday, June 6, 2015 for the annual Strawberry Festival which kicks off Linvilla’s Pick Your Own Season. 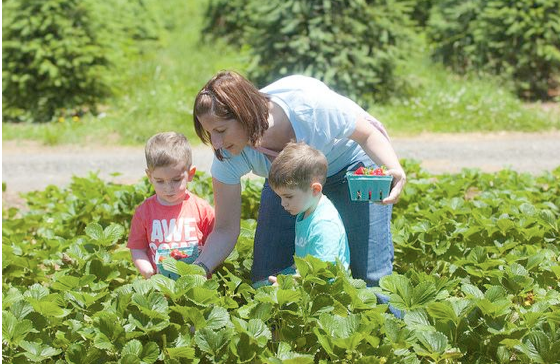 The fields will be open to pick your own fresh, juicy strawberries to take home with you. It’s a fun-filled day to enjoy with family and friends as you experience our prince and princesses themed activities. There will be contests, story time and a rocking performance by Makin’ Music, not to mention all of Linvilla Orchards exciting regular attractions! Dress up and enjoy the fun! And you won’t want to miss the Bakery unveiling Delaware Valley’s largest Strawberry Shortcake! While the kids are enjoying the festivities, everyone can join Jammin’ with Judi to learn how to keep those beautiful berries preserved, as well as her own secrets to making the best jam. It’s going to be an amazing summer of picking, from fresh blueberries, raspberries, peaches, tomatoes, pears, blueberries and corn! Linvilla Orchards is located at 137 West Knowlton Road in Media PA, 19063. Entertainment goes from 11 a.m. – 4 p.m, but picking starts at 8 a.m. and continues until dusk! Please visit http://www.linvilla.com for more information. The rain date will be Sunday, June 7, 2015. This entry was posted in events on June 4, 2015 by Breslow Partners.